If you’re planning on building your own smart mirror, the material you use plays an important part in how your smart mirror looks. Different styles and types of smart mirrors require different materials and some materials are more expensive than others. You have two options with your smart mirror: glass or acrylic. Glass is more expensive than acrylic, but can give better results. Acrylic can flex and slightly distort the reflected image, which may be unnoticeable on small smart mirrors, but a disaster on large bathroom-sized mirrors. The right option for you depends on your budget, the size of the smart mirror you want to build, and the style of your mirror. Let’s look closer at the different options you have so you can make the right choice for your smart mirror. The amount of money you want to spend on your smart mirror might tell you which material to use. As I cover in my article on the costs of building a smart mirror, there can be a massive difference in cost between a glass smart mirror and an acrylic smart mirror. There are also two different options for glass. The most expensive option is to buy a pane of two-way glass. This is when the glass is manufactured with the reflective two-way film. These two-way mirrors are incredibly expensive, but give the best possible quality for your smart mirror. The other option is to buy a regular pane of glass, then stick two-way film onto the glass. It’s much cheaper to buy regular glass and add film to it, but the results won’t be as good as a proper two-way mirror. Adding film to glass is the approach I used for my large bathroom mirror. Acrylic would have produced too much distortion and would have looked terrible. Getting a proper two-way mirror manufactured would have cost me over $1,000. So adding film to glass was a way I could get a good looking mirror at a reasonable cost (around $200). Bottom line: acrylic will be cheaper than glass, but acrylic only looks good on small to medium sized smart mirrors. The larger your smart mirror, the more acrylic sheets will distort the reflected image. If you’re planning on building a large smart mirror, use glass. If you’re planning a small to medium sized smart mirror, pick the best option that fits your budget. At first this type of direct comparison looks really helpful. You can clearly see there’s a big difference between some of the above panels. A quick glance at the above photo and it should be obvious which panel you should use for your smart mirror. Glass looks terrible when compared to acrylic, which both look terrible against the other two options. But there’s a flaw in this type of comparison. The brightness of the display coming through the glass is only one part of a smart mirror. The other part is the reflection quality. Can you tell from the above photo which panel gives you the best mirror-like finish? Not at all. Be wary of these type of comparisons. The only places I’ve seen comparisons like this is from websites that sell ‘special’ panels designed for smart mirrors. It’s no surprise that their most expensive options always look the best in these comparisons. These companies want to sell you their expensive proprietary materials, so of course they will make sure they look the best in comparisons. While the above photo makes it look like there’s a huge difference between glass and acrylic, there’s actually very little difference between glass and acrylic. It’s not the material that makes the difference, it’s the reflective film. The differences you see in the above photo (or similar comparison photos) are due to the different qualities of the reflective films used on the back of each panels. If the same film was used on all of those panels, the differences between them would suddenly disappear. The above photo might be comparing a 70% reflective glass against a 50% reflective acrylic. In other words, not a fair comparison. The point to take away here is that these type of comparisons are misleading. What might look like the best option in the above photo may be overkill for your smart mirror. The worst looking panel in the above photo might be perfectly fine for your needs. Don’t be fooled by comparisons like the above photo. The obvious benefit, as mentioned above, is that acrylic is cheap and easy to use. You can easily buy a sheet of two-way acrylic, slap it in a frame and mount your display. You can even cut acrylic sheets fairly easily to get the perfect size for your smart mirror. Another benefit to using acrylic is the weight. Acrylic sheets will be far lighter than glass sheets. If you’re building a medium sized frame and have no choice but to mount it into your drywall, weight may become a concern. While a good french cleat (as covered in this article on mounting a smart mirror to a wall) can hold a lot of weight, be aware that glass will always be far heavier than acrylic. A downside of using acrylic is when it comes to larger smart mirrors. Acrylic can warp and distort the reflected image. Even a slight pressure from the display or frame can be enough to turn your smart mirror into a fun-house mirror. In smaller builds you may not notice any distortions at all. As the size becomes larger, distortions become far more noticeable. Using an acrylic sheet for a large bathroom mirror would end in disaster. 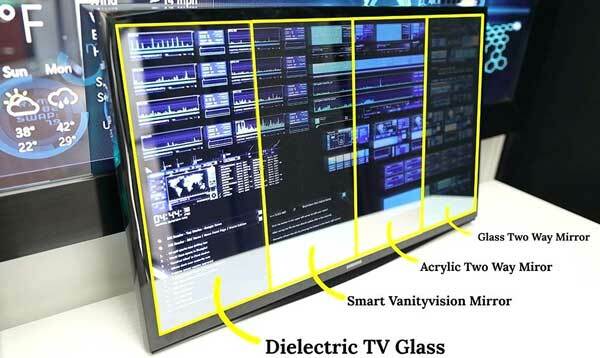 Another downside of using acrylic is if you want to build a borderless smart mirror. Acrylic sheets aren’t suitable for borderless smart mirrors. The edges will look terrible and trying to mount an acrylic sheet as a borderless mirror will create horrible distortions. 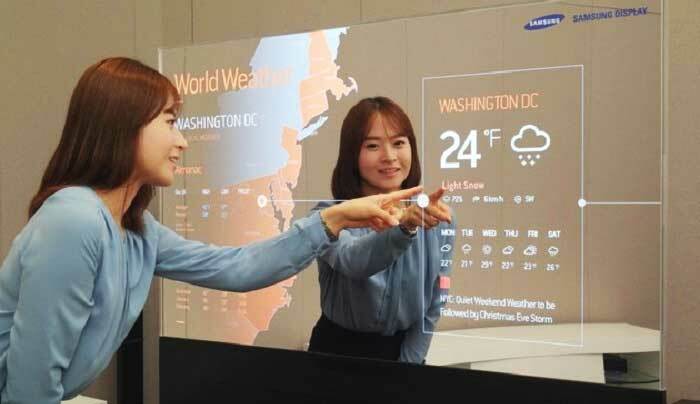 If you don’t plan on building a borderless smart mirror this won’t be a problem. But if you’re considering a borderless smart mirror, keep this in mind. Bottom line: acrylic is cheaper and allows you to cut it to the exact size you require. The downside is it can warp or distort and doesn’t look good as large mirrors. Glass smart mirrors can look amazing. When the display is off, they can look indistinguisable from normal mirrors. While you might not be able to notice any difference between a small glass smart mirror and a small acrylic smart mirror, the differences will become obvious with larger mirrors. One of the reasons why glass smart mirrors can look so good is because of the strength of glass. Glass gives a nice flat surface that won’t warp or distort the reflected image. For large smart mirrors this is important as you will notice any warping. A great benefit of glass is it gives you the option of going borderless. I’ll cover this further down in this article as it’s worth thinking about. A downside of using glass is the weight. Larger sheets of glass need to be produced thicker for added strength. Having a thicker sheet of glass can add a lot of weight. The weight of the glass I used in my large bathroom mirror is 37.5 lbs (17kg). That’s a lot of weight to consider. Not only do you want to make sure you build a frame that can properly support that weight, but you need to be extra careful when mounting the mirror on the wall. The last thing you want is for a large sheet of glass to come crashing down on a child. Bottom line: glass is strong and can give fantastic results when used for smart mirrors. 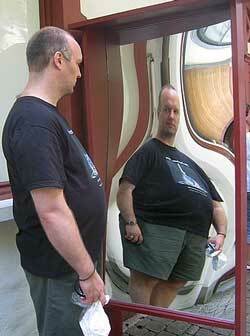 Larger smart mirrors should use glass to avoid warping or distortions. The downside is glass is harder to work with, weighs more, and costs more. Almost all of the smart mirror builds you see online have framed borders. This is because they’re easy to build. 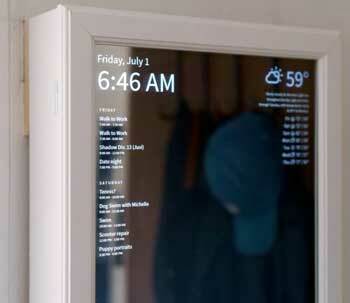 Anybody can build a framed smart mirror. You simply buy a glass frame or build your own frame around your sheet of glass or acrylic. Framed smart mirrors can look fantastic in many different situations and will be the right choice for many people. Borderless smart mirrors are harder to build, but make a big difference to the style of the room. The reason I built a borderless smart mirror for my bathroom is because they look fantastic as bathroom mirrors. Depending on the style of your home, you may find that a borderless smart mirror fits in better. They can give a futuristic or modern look, while framed mirrors tend to have a more older feel to them. If you decide to build a borderless smart mirror, there are a few things to keep in mind. First, glass is the right choice. Acrylic sheets will distort and look cheap when mounted as a borderless mirror. Glass won’t have that issue. Borderless mirrors can be mounted through holes in the glass, or with mounts that grab the edge of the glass. The cheap and easy option is to buy mounts that grab the edge of the glass (check these options in my list of recommended parts). The harder option is to mount the glass by drilling holes in it and using a standoff mount. This is the option I chose for my bathroom smart mirror so the edge would be completely visible. If you’re ordering a custom sheet of glass, simply include instructions to drill holes in the correct positions at the correct sizes. If you want to drill the holes yourself, there’s a few things to keep in mind. First, don’t try to drill through toughened glass. Toughened glass will shatter instantly as soon as you try to drill through it. If you want to use toughened glass, you need to drill the holes before the glass is sent off for toughening. If you’re drilling through untoughened glass, take it slow and use the appropriate equipment. If you’ve read through all of this article, you should have a good idea whether acrylic or glass better suits your needs. What Do I Need To Build a Smart Mirror? What Monitor Should I Use For a Smart Mirror? How Can I Mount a Smart Mirror to a Wall? Smartmirrorguide.com is a participant in the Amazon Services LLC Associates Program, an affiliate advertising program designed to provide a means for website owners to earn advertising fees by advertising and linking to Amazon (.com, .co.uk, .ca etc) and any other website that may be affiliated with Amazon Service LLC Associates Program.